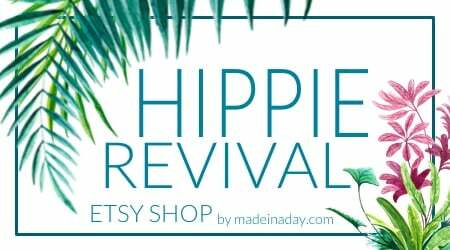 Looking for a gorgeous new wreath design to adorn your door this spring? I have just the one for your decor. 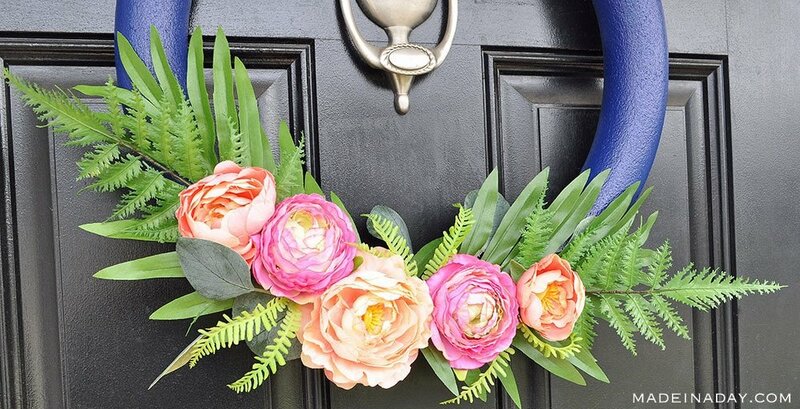 I combined two different decor trends this season to create this Stunning Navy and Pink Tropical Spring Wreath. For more wreaths from my evergrowing collection see my Wreath + Plants page. 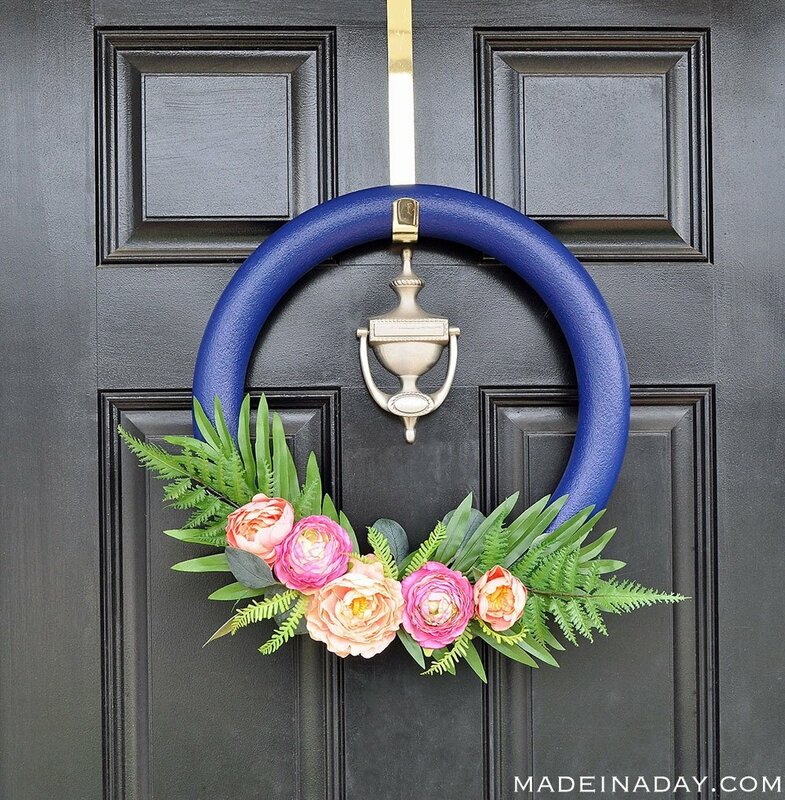 Today with a little the help from my friends at Hobby Lobby I am going to show how you can easily put together this lush navy blue and pink tropical spring wreath using some of this season’s popular floral stems. 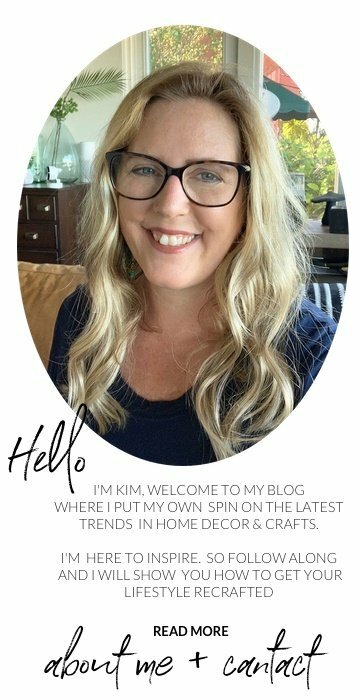 When I started thinking about what kind of spring wreath I wanted to make this year, I knew I wanted it to go well with my current decorating style. I am seriously in love with all things tropical right now. My home is riddled with tropical plants and bright colors. 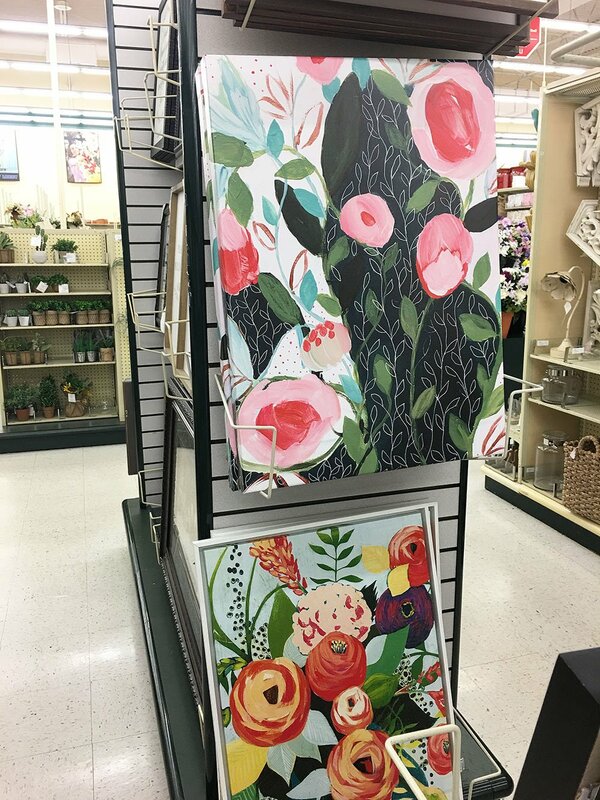 I was so thrilled when I saw the huge selection of tropical stems and bushes in Hobby Lobby’s floral section. Another trending design element is the dramatic navy blue floral patterns. 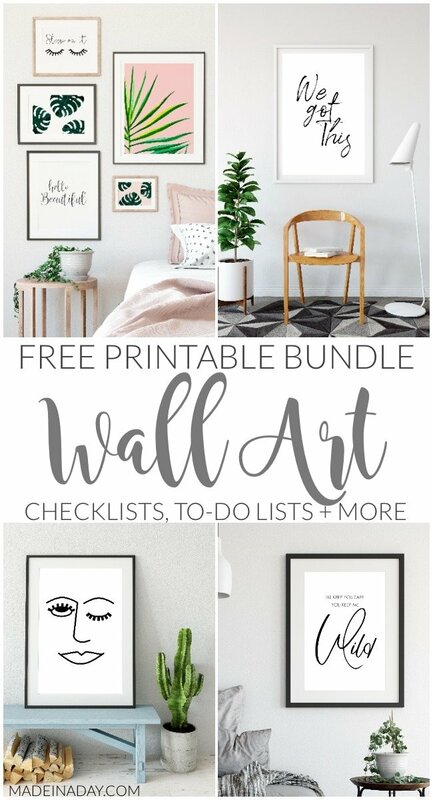 I see it popping up on everything from wall art to stationery. I snapped this image above while strolling Hobby Lobby’s isles and it is my inspiration for the colors of this wreath. Minimal hoop wreaths are also one of my favorite design looks. I think putting all the emphasis on the flowers makes a wreath more dramatic. 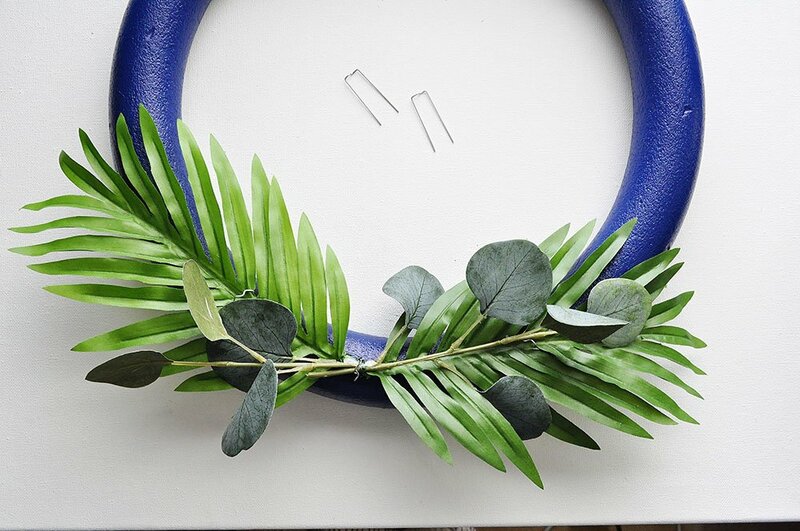 I decided to combine all three of these popular trends to make one strikingly beautiful tropical wreath. NOTE: There are a couple of types of hoops that you could use a base for this project. 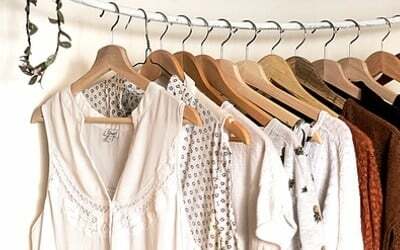 There are wood embroidery hoops and metal macrame hoops, both come in various sizes. I wanted to add color to the background of this wreath. So, I decided to use a narrow, 2-inch, smooth foam wreath for the base. 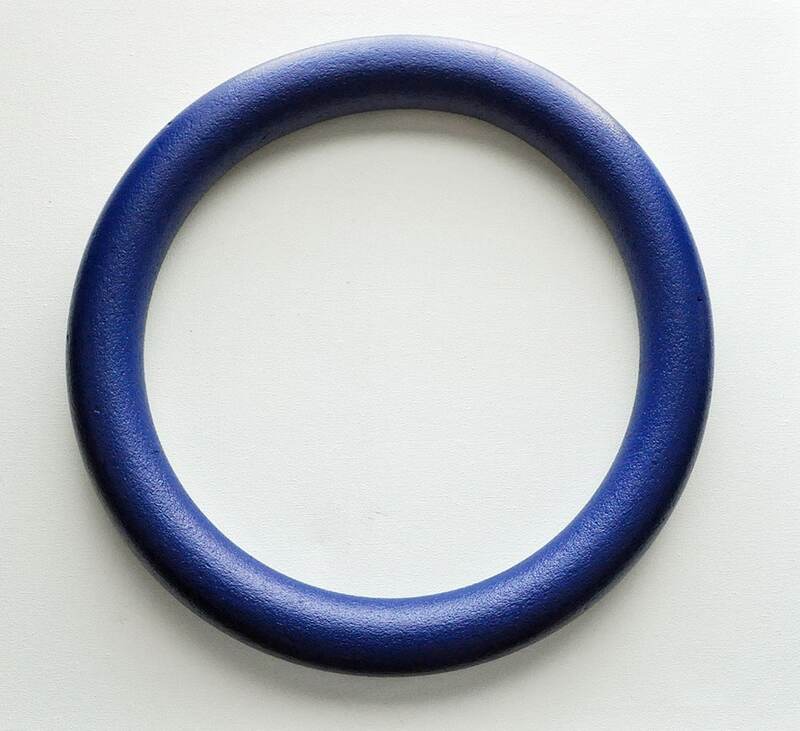 The foam form is thin enough to have the look of the thin hoop bases. Plus it is thick enough to paint and still have the flowers stand out. 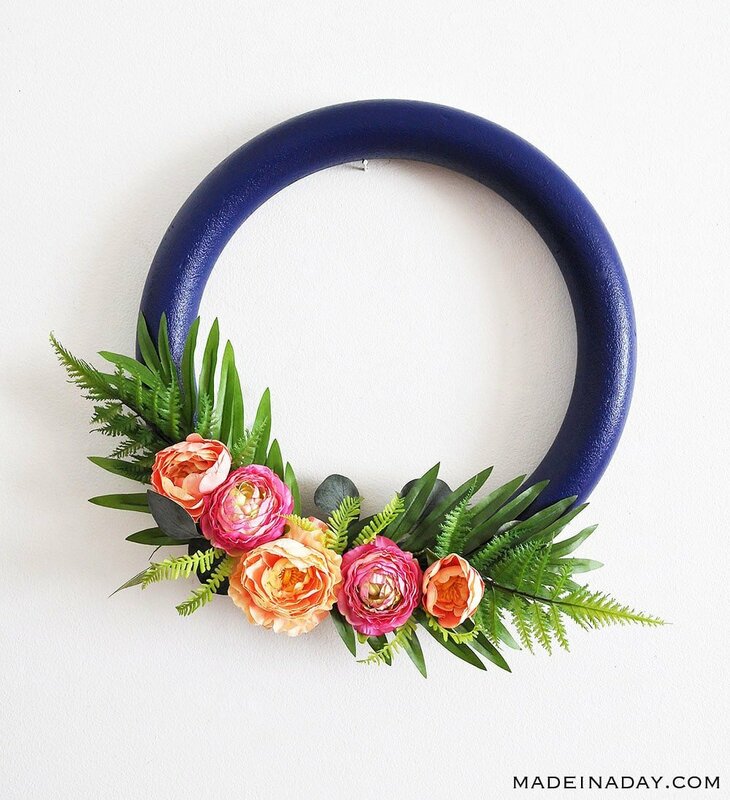 Paint the foam wreath base with navy blue acrylic paint and let it dry completely. 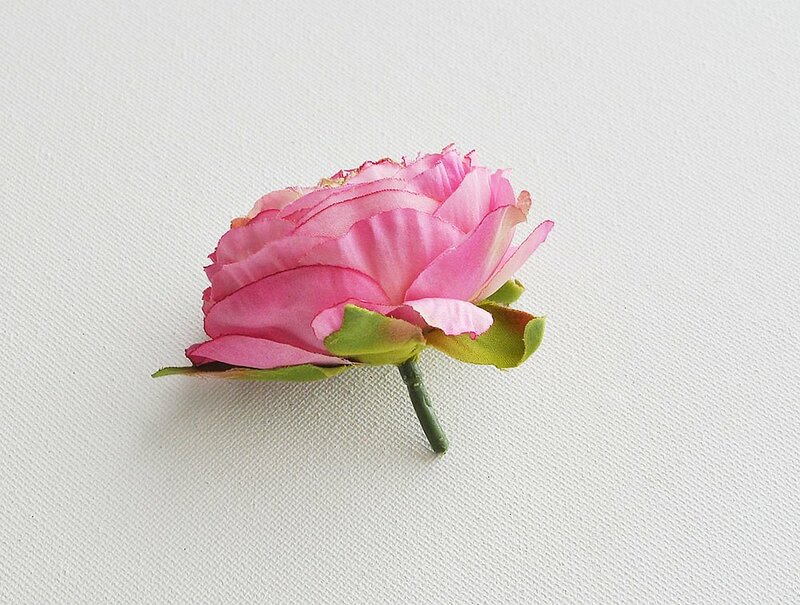 The trick to making professional floral designs is to first trim your silk flower stems or bushes of flowers apart from each other with pliers before you arrange them in a base. 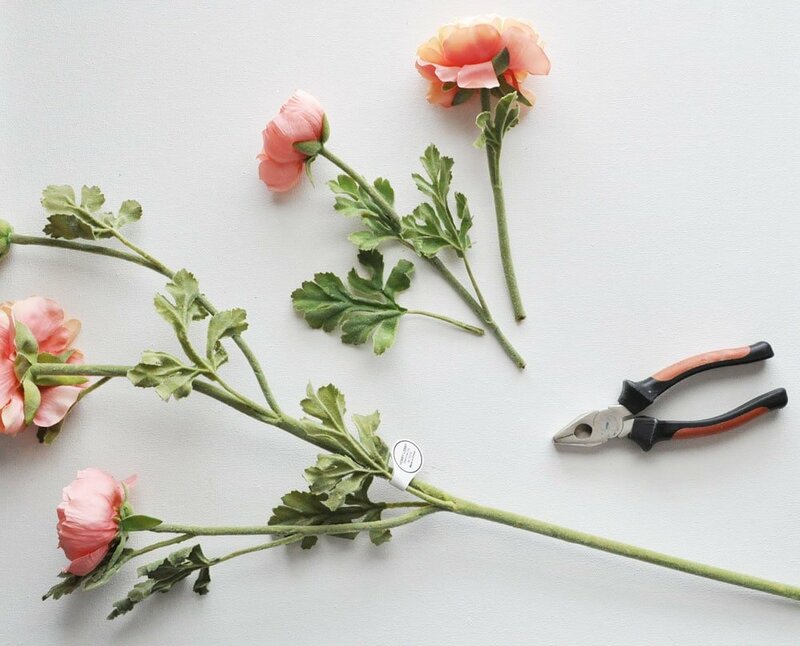 For this project you need to trim the flower stems down to around one inch near the base of the bloom. 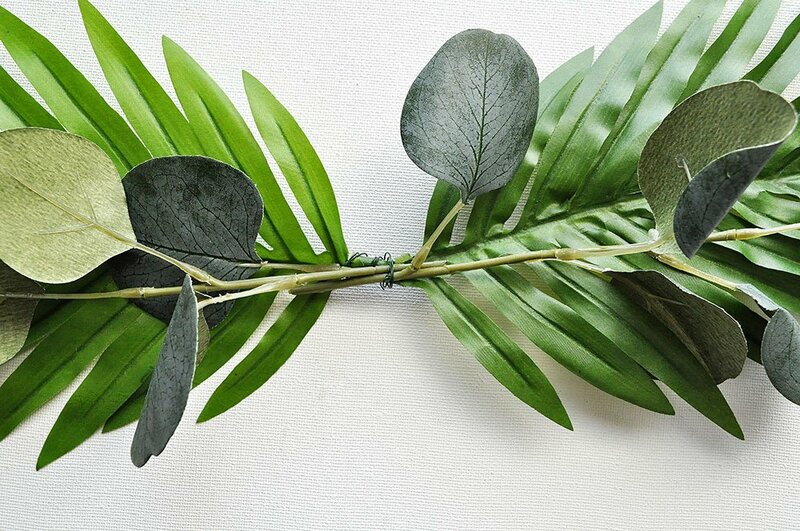 Make a palm base for the flowers: Secure two palm fronds and two small eucalyptus stems, by facing the stems inwards then wrapping them with floral wire together in the center. Add hot glue over the wire as needed for strength. 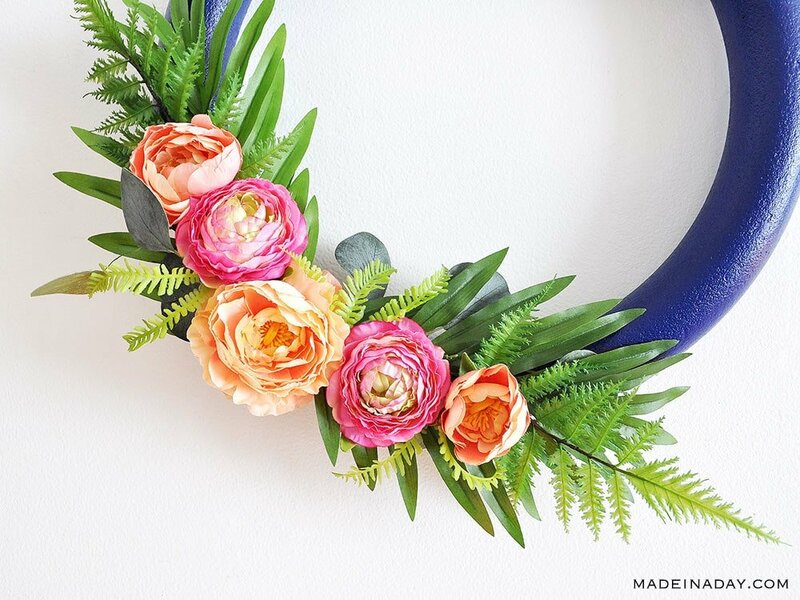 Pin the palm base on the foam wreath form with floral pins. 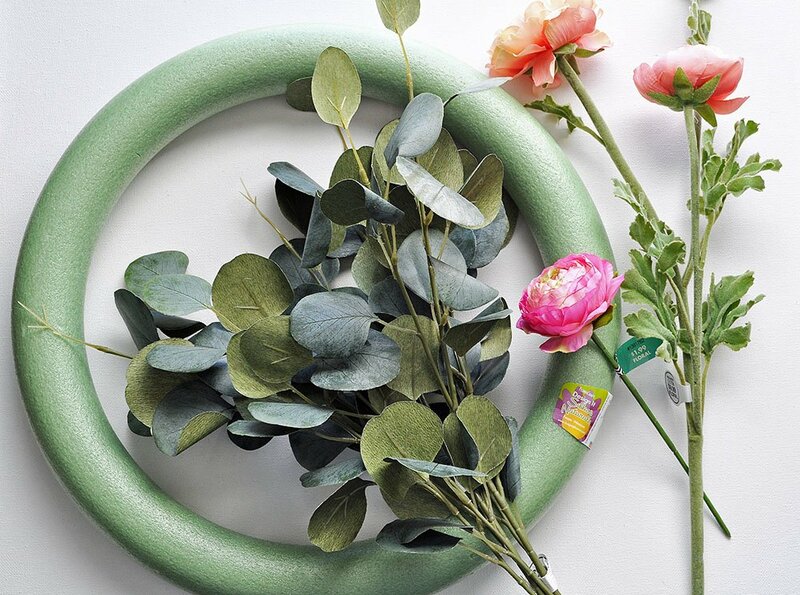 Push the flower tops or blooms into the foam in random places to arrange. 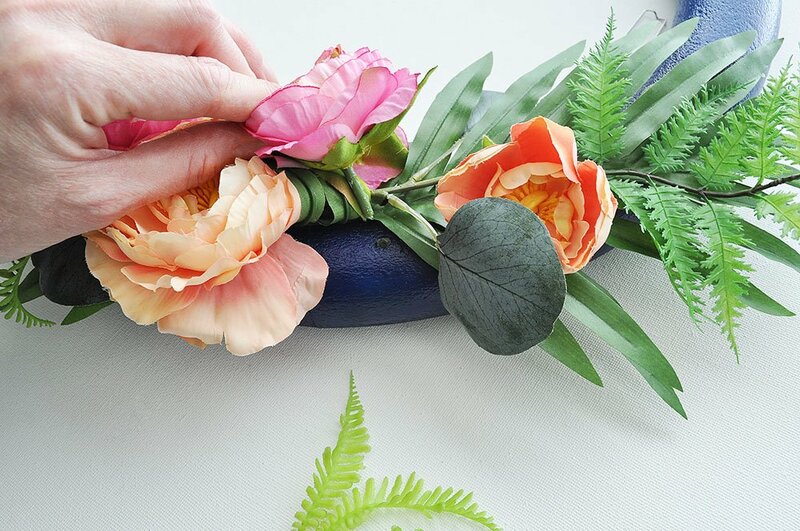 Once you have the blooms where you want them on the form, pull them out of the foam and add a dot of hot glue to the stems. Push the stems back into the foam in the previous hole you made. Add the large fern stems on each side of the arrangement. Add the small fern picks in between the flowers. Glue the stems and picks so they are secure. 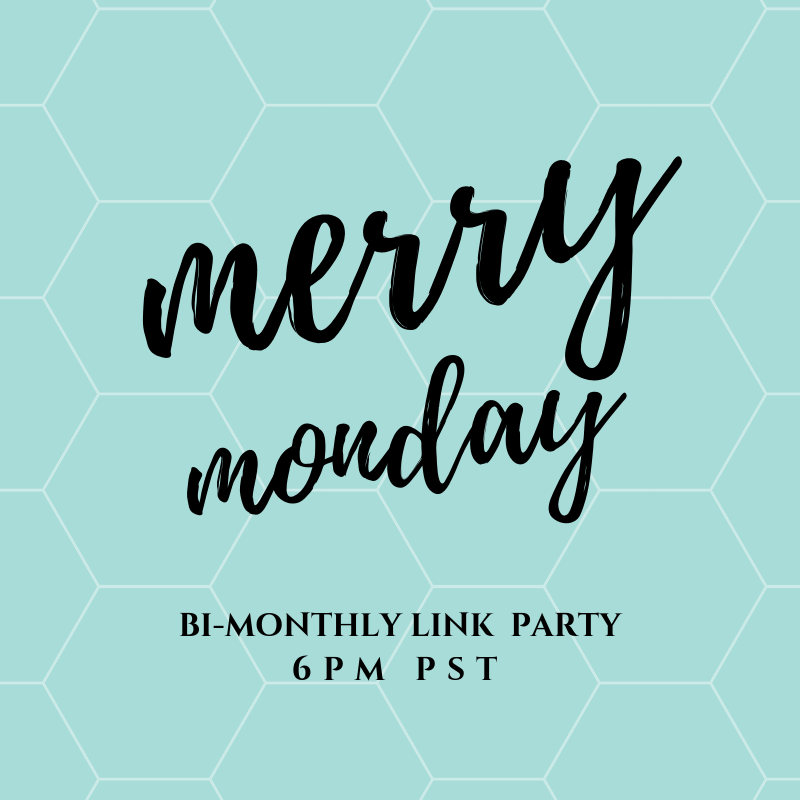 Hang the wreath on your front door and enjoy! This wreath turned out so bright and cheery. It just screams spring! The ferns and palm leaves really make the blooms stand out. 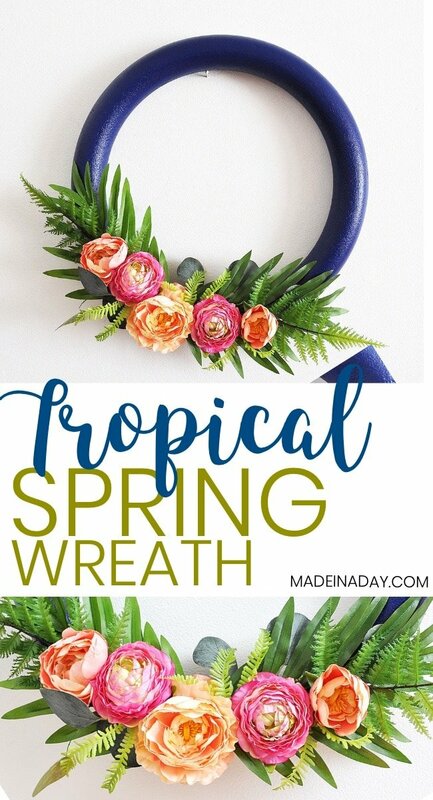 Do you want to try making this easy tropical spring wreath? 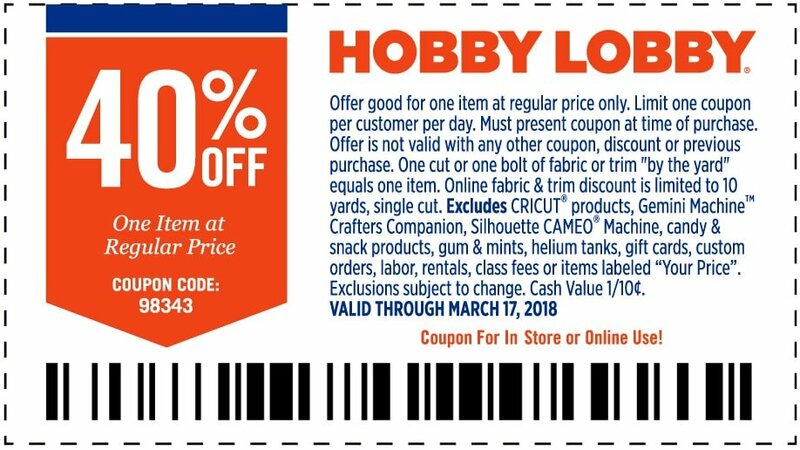 Then grab the coupon below and go to your nearest Hobby Lobby to grab the supplies to make this wreath! Happy Spring! Very pretty. I love that pop of dark blue behind the flowers too. PInned. It’s so pretty for Spring. I love the color combination of Navy Blue with Pink and the tropical look. Very pretty!! Love the choice of navy!! 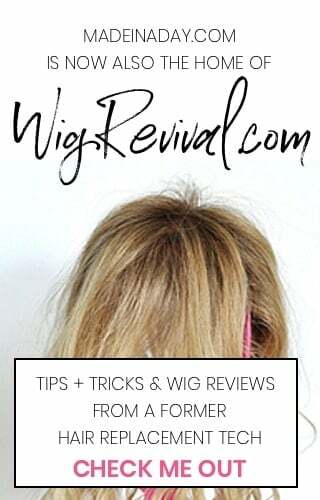 Thanks so much for taking the time to stop by!! This wreath turned out so cute! I love that you painted the foam wreath form blue and the foliage and flowers you selected for it are stunning! Thanks so much Carrie, I think the blue make s the pop just right. Thanks for stopping by!